Yes, it's my 5' yacht docked at Renssellaer Lake (also known as Six Mile Waterworks). Ok, maybe it's not what you expected. 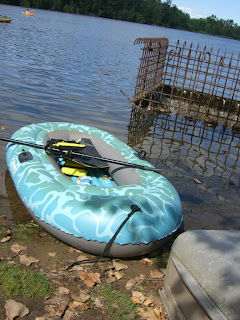 Yup, I'm about the only fool who boats on the lake in an inflatable, but it works for me. No need to strap a big kayak on the top of my car, deflate it a little and it fits nicely in my mid-size car. All I need to do is quickly add a little air from my portable pump and viola, my yacht awaits for another adventure. 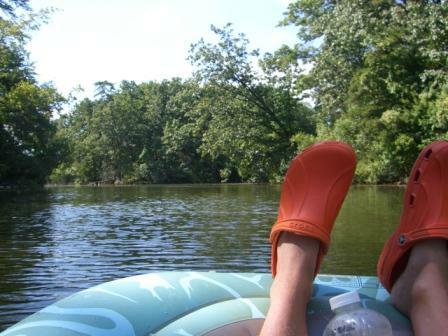 The kayaks seen in the background are part of L.L.Bean's adventure excursions which can be booked at the Colonie Mall. I believe the cost is around $20 and it is well worth it as an introduction. You'd be amazed at all you'll see in the back portion of the lake - numerous turtles, a frequent blue Huron among beautiful, natural views. Surprisingly, I have not been bothered by bugs while boating on this lake. 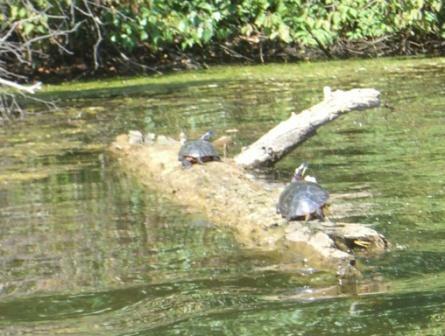 If boating is not your things, there are many trails in this back wooded area of the Albany Pine Bush. Please note that you can get lost in this area and years ago when I did walk this area, I do recall a generous supply of mosquitoes. Passing through the narrow channels where the I-87 (the Northway) highway and ramps pass over the water is tricky and the 4th overpass right before the pedestrian overpass is very shallow. My boat often rubs bottom going over this section. Another tricky spot is after you pass the narrows, but before entering the wide body of water in the back part of the park. There is a fallen tree and generally you need to keep your boat near parallel to another fallen tree on the right to squeeze past the tree and a broken branch that points upward in the water blocking the greater part of the opening. Once passing into the back water of the park, there are 2 prongs of water to explore. The prong to the left is a bit shorter and veers toward the I-90 Entrance / Exit. On one trip, I spotted a huge turtle, larger in circumference than both of my hands joined to form a circle on this prong. The prong to the right travels in a bit more windy path. On this prong, I frequently see a blue Heron. Paddles - Wherever you can get a great deal, I purchased mine at the Sports Authority which often has great coupon deals. I've also seen great deals at Ocean State Job Lot). Air Pump - Anywhere you can find a great deal. I found mine at Big Lots. Sunglasses - the sun reflect strong off the water. (I found some great sunglasses at 5 Below). If you do go boating on this lake, keep in mind that the area past the Northway overpass is remote. Use caution not to exceed your skill. If you have concerns, consider L.L. Bean's $20 discovery course. In the back area there are many areas where you cannot easily beach your boat and if you step out you will likely sink in the mud and muck (in addition to please be aware that there are snakes and turtles that can potentially bite)... so my advice, stay in your boat and happy yachting!